Sometimes I really wonder if starting this airliner template project was a good idea or not. 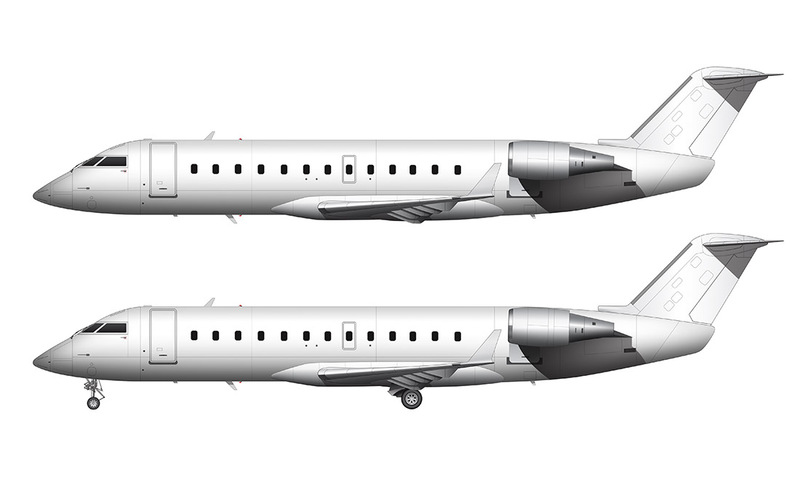 Of course I really enjoy working on these highly detailed side-profile illustrations, but the sheer number of aircraft on my “to do” list has been overwhelming for much too long and the reality is that I’ll probably never get around to doing them all. That’s not a very comfortable feeling for me, primarily because having too much to do sends my anxiety levels through the roof (lol) and I never really feel satisfied that I’m making progress. But as long as I just focus on on aircraft at a time, things are more manageable and I can keep moving forward. Today’s area of focus is squarely on the 737-900/ER. I created my original 737-900/ER template way back in 2014, but that one had the normal-style winglets and some missing details that I never got around to adding. The way that I shaded the all-white version had been bugging me as well (the shadows were much too dark IMHO), so I finally decided to dig it up from my archives and make some of those much-needed updates. 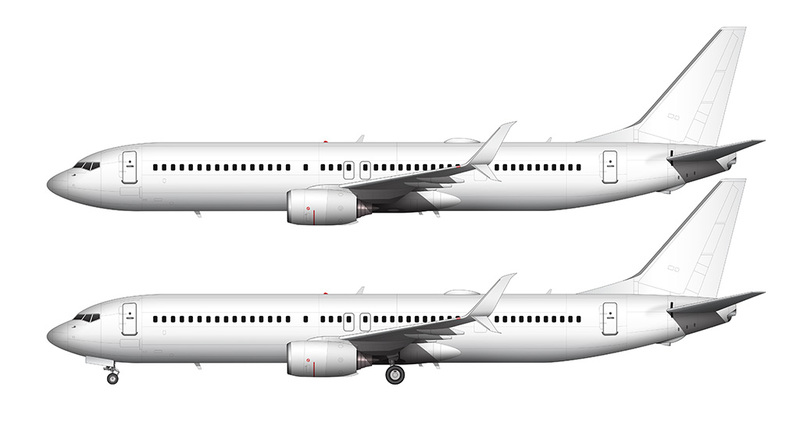 The biggest change is the addition of the split scimitar winglets. Most airlines seem to be opting for these over the older-style winglets, so I thought it was important to have this version in my collection for anyone needing it (which is a lot of you, since I’ve been getting a lot of requests for it). I’ve also added a few details, like the satellite communications dome on the top of the fuselage, as well as adding some window “blanks” to make it more realistic. Finally, I spent some time adjusting all the shading and shadows, fixing all the problem areas which made the original template much too dark and muddy. It’s really hard to create a single style of shading for all my templates – my personal tastes and styles change over the years, and back then (when I first created this template), I was into very exaggerated and “strong” imagery. These days, I’m all about simplicity and cleanliness. I’d love to go back and fix all my earlier illustrations to bring them up to date with my current lighter style, but unfortunately, there aren’t enough hours in the day to take on a project that big! Hope you enjoy this little update. The Boeing 737-7 MAX is on the drawing board and will be available soon. I just did an livery on this plane regarding you and your website. Hope you like it. Also. I found out that if you fill the website bar when posting a reply, the reply won’t be sent so please fix this problem. Parsa that’s so cool!! I like the sound of “Norebbo Air” quite a bit. Want to go into business together? Haha. Anyway, thanks for putting that together – I really like it! Interesting – I had no idea, so I’ll look into it. Thanks for letting me know. 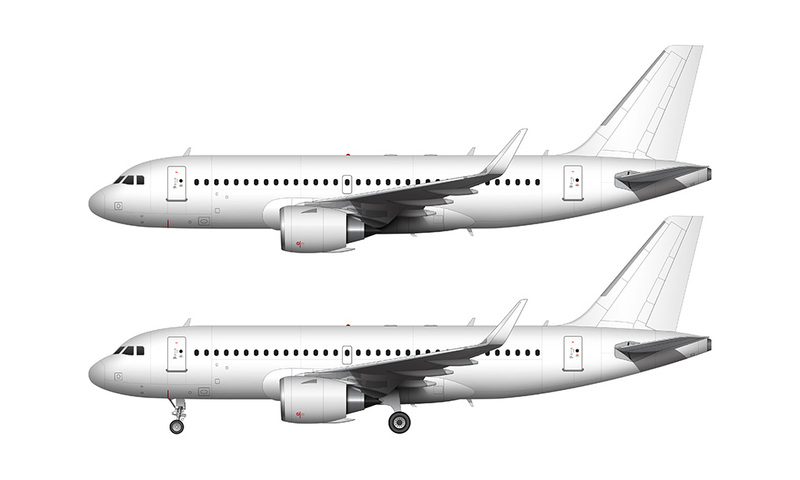 Can you draw a version with standard 737NG winglets? Actually I already did. I thought I posted here to the blog, but I guess I didn’t. It’s on my online store though.